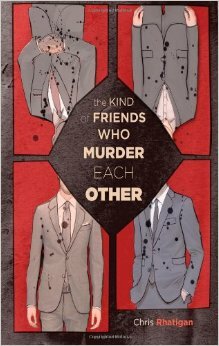 Gutter Review: The Kind of Friends Who Murder Each Other, by Chris Rhatigan. Never has this quote seem more prophetic than in Chris Rhatigan’s The Kind of FriendsWho Murder Each Other. Three people share their secrets and all three are willing to kill to keep them secrets. The problem with their indiscretions become apparent when they each become paranoid that the others now have a bargaining chip over them. They realize that the only way to rectify their mistake is through the elimination of the other two. Each friend sets out to put their own plan of self-preservation into action, while also watching their own backs. This is noir just the way I like it … a quick hit that leaves a mark. I'm very glad to see this book getting re-released and it's apparent All Due Respect has another winner on their hands. Friends is a noir lovers dream and is best consumed in one sitting so you can truly appreciate Rhatigan’s genius.